The US Department of Energy (DOE) has an initiative called “SuperTruck”. Under the program, the DOE gives significant grants to truck manufacturers to increase the fuel economy of medium- and heavy-duty vehicles by developing new technologies. Daimler is one of the truck manufacturers taking the most advantage of the program. 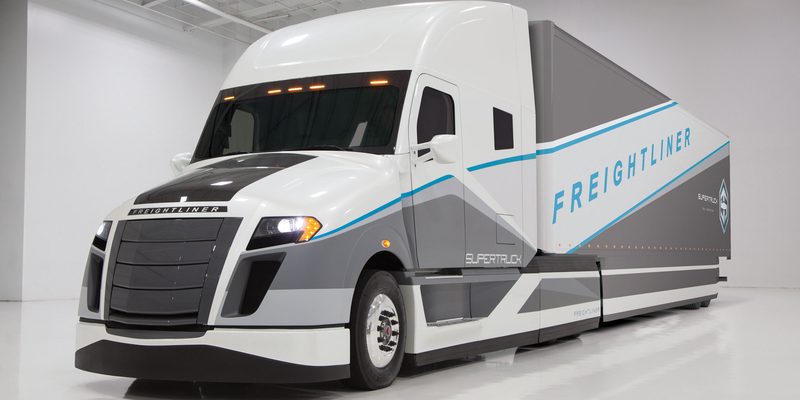 Under the first version, it developed the 12-MPGe Freightliner SuperTruck, and it recently announced that it won $20 million out of the DOE’s $80 million in grants for the second round of the program – appropriately named ‘SuperTruck II’. Electrek has learned that Tesla hired several key engineers who previously worked on Daimler’s SuperTruck program, which is particularly interesting now that we know Tesla is working on its own truck: ‘Tesla Semi’. We know that Tesla tapped former Model S Program Director and Daimler’s Cascadia GM, Jerome Guillen, to lead the ‘Tesla Semi’ project. Before joining Tesla in 2010, Guillen was a longtime Daimler executive and he led all new Class 8 truck development at Daimler Trucks North America in Portland Oregon, where the company was working on the ‘SuperTruck’ and is now presumably working on ‘SuperTruck 2’. Over the past year, several engineers from the program joined Tesla, most recently Evan Chenoweth, who worked on the design of Daimler SuperTruck’s hybrid engine since the inception of the progran, has joined Tesla last month as a Sr. Mechanical Design Engineer. Daimler’s Freightliner SuperTruck achieved a 12-MPGe with an 11-liter diesel engine paired with an electric motor, which is about 115% better than the average Class 8 truck on the road today. Tesla is aiming for an even more significant improvement. While most companies working on the DOE’s SuperTruck program focused on hybrid powertrains or on increasing efficiency, Tesla is believed to be working on an entirely battery-powered truck. The development of an all-electric truck would certainly fall under the requirements for ‘SuperTruck II’ and the DOE has yet to assigned all $80 million in grants for the second round of the program. Tesla didn’t answer inquiries about whether or not they applied for the program with their ‘Tesla Semi’ project. Back in June, Tesla CEO Elon Musk described Tesla Semi as being in the “early stages of development”, but he also said that we should expect an unveiling of the concept in the next 6 to 9 months.